424 in Persia Isdegerdes, son of Sapor III, put a stop to the cruel persecution against the Christians in Persia, which had been begun by Sapor II, and the church had enjoyed twelve years' peace in that kingdom when, in 420, it was disturbed by the indiscreet zeal of one Abdas, a Christian bishop, who burned down the Pyraeum, or temple of fire, the great divinity of the Persians. King Isdegerdes threatened to demolish all the churches of the Christians unless he would rebuild it. Abdas had done ill in destroying the temple, but did well in refusing to rebuild it; for nothing can make it lawful to contribute to any act of idolatry, or to the building a temple, as Theodoret observes. Isdegerdes therefore demolished all the Christian churches in Persia, put to death Abdas, and raised a general persecution against the church, which continued forty years with great fury. Isdegerdes died the year following, in 421. But his son and successor, Varanes, carried on the persecution with greater inhumanity. The very description which Theodoret, a contemporary writer, and one that lived in the neighbourhood, gives of the cruelties he exercised on the Christians strikes us with horror: some were flayed alive in different parts of the body, and suffered all kinds of torture that could be invented: others, being stuck all over with sharp reeds, were hauled and rolled about in that condition; others were tormented divers other ways, such as nothing but the most hellish malice was capable of suggesting. 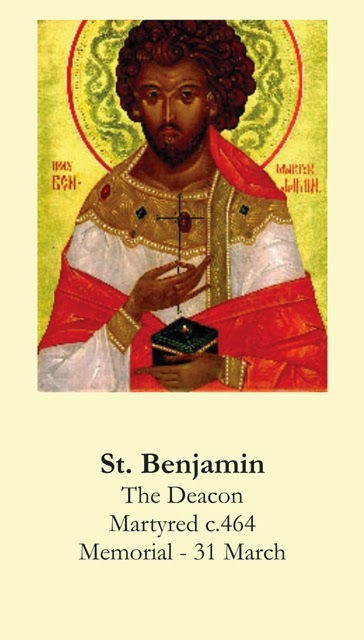 Amongst these glorious champions of Christ was St. Benjamin, a deacon. The tyrant caused him to be beaten and imprisoned. He had lain a year in the dungeon when an ambassador from the emperor obtained his enlargement on condition he should never speak to any of the courtiers about religion. The ambassador passed his word in his behalf that he would not; but Benjamin, who was a minister of the gospel, declared that he could not detain the truth in captivity, conscious to himself of the condemnation of the slothful servant for having hid his talent. He therefore neglected no opportunity of announcing Christ. The king, being informed that he still preached the faith in his kingdom, ordered him to be apprehended; but the martyr made no other reply to his threats than by putting this question to the king: What opinion he would have of any of his subjects who should renounce his allegiance to him, and join in war against him? The enraged tyrant caused reeds to be run in between the nails and the flesh both of his hands and feet, and the same to be thrust into other most tender parts, and drawn out again, and this to be frequently repeated with violence. He lastly ordered a knotty stake to be thrust into his bowels, to rend and tear them, in which torment he expired in the year 424. The Roman Martyrology places his name on the 31st of March. St. Ephrem, considering the heroic constancy of the martyrs, makes on them the following pious reflections: "The wisdom of philosophers, and the eloquence of the greatest orators, are dumb through amazement, when they contemplate the wonderful spectacle and glorious actions of the martyrs: the tyrants and judges were not able to express their astonishment when they beheld the faith, the constancy, and the cheerfulness of these holy champions. What excuse shall we have in the dreadful day of judgment, if we, who have never been exposed to any cruel persecutions, or to the violence of such torments, shall have neglected the love of God and the care of a spiritual life? No temptations, no torments, were able to draw them from that love which they bore to God; but we, living in rest and delights, refuse to love our most merciful and gracious Lord. What shall we do in that day of terror, when the martyrs of Christ, standing with confidence near his throne, shall show the marks of their wounds? What shall we then show? Shall we present a lively faith? true charity towards God? a perfect disengagement of our affections from earthly things? souls freed from the tyranny of the passions? silence and recollection? meekness? almsdeeds? prayers poured forth with clean hearts? compunction, watchings, tears? Happy shall he be whom such good works shall attend. He will be the partner of the martyrs, and, supported by the treasure of these virtues, shall appear with equal confidence before Christ and his angels." We entreat you, O most holy martyrs, who cheerfully suffered most cruel torments for God our Saviour and his love, on which account you are now most intimately and familiarly united to him, that you pray to the Lord for us miserable sinners, covered with filth, that he infuse into us the grace of Christ that it may enlighten our souls that we may love him, &c."